Jewelry box, It just Pops! 6”W x 3.25”D x 1.5”H. I was really happy how this box just really pops! Used two coats of tung oil finish and the spalted maple took the finish very differently across the piece to where part of the wood and spalting lines stayed for a nice finish and the rest of the maple really soaked it in so it appears like two different finishes on the top, one semi-gloss and one flat. It kinda looks like a map! The figured walnut also does it’s best to raise off the surface! I decided to leave the worm hole in place (top right) as part of the natural character of the wood. This was made as a gift but I’m really having a hard time giving this one away since it turned out so unique, but it will go anyway. Beautiful! Where did you source those hinges? Beautiful little box! The best part is, that you let the wood “speak”. The spalted maple is spectacular and works well with the walnut. Congratulations! Interesting box. I like the wood on the top, but don’t like that finish. Looks like it wasn’t sanded real well before the finish was applied. otherwise it really should have closer to the same finish as the sides, which look pretty good. Usually the highly figured, and spalted woods need more attention when sanding, card scraping, planing with a hand plane to get it closer to putting on finish. I also routinely go over 220 grit sanding, to get the really fine stuff working it down as smooth as I can. I also raise the grain, and sand further, then re-wet to make sure I’m done. The figured because you are running into different grains, the spalt usually just because it decays at different speeds, and across that change in the wood you will see different densities, and sometimes it will finish a lot like a curly board with some grain open, some right near it closed. All of that requires 2 or more times the sanding/scraping/planing effort before you finish. The other thing to check on any spalt, is to make sure it isn’t punky anywhere before starting with it. Punky is the too decayed wood, usually just plain old too soft to use. Turners will use CA glue in hopes it absorbs, and re-hardens the wood. My experience doing that with pieces like your top, is it sometimes works, sometimes doesn’t But that also is wood that will absorb finish strangely. If you have more of that spalted, really sand it, card scrape it, then sand some more with finer, go to at least 320, and then finish it, see if it isn’t more consistent. I’d keep that box, and send another, but that is me. Just a quick question about the inside. What did you line it with and what method did you use. Also jmo, that last post was way harsh. I understood what he was saying but it came across like a know it all. I think the box is great, just how it is. Aesthetic cannot be judged since it is all subjective. You can only state what or how the piece evokes you in whatever manner. It’s just amazing that something rotting, caused by an all consuming fungus, turns out to be so beautiful (i.e. my subjective opinion. I’m sure the wood’s opinion would be quite the contrary. Thumbs, spalted wood has its own beauty. The piece you used is quite beautiful. 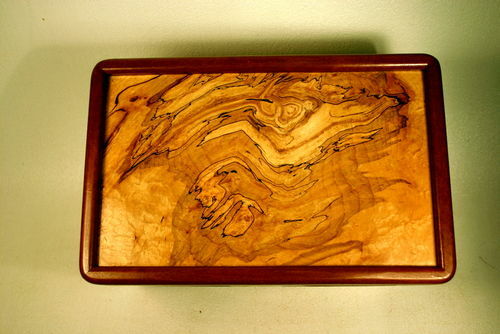 I had a similar piece of spalted maple that I used in a box top. This is a posting about how I approached finishing it. Just click on the blue words and it will take you to the posting. Thanks for sharing your beautiful work with us. Keep boxing and keep posting. I stopped at two coats of Tung Oil intentionally because I liked the effect it made on this piece of wood. Yup, I could have kept sanding / finishing but decided not too.